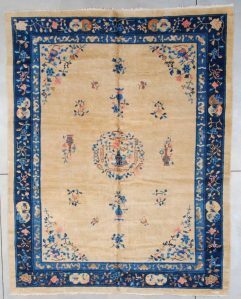 This circa 1800 or earlier Chinese rug measures 5’7” x 9’2”. 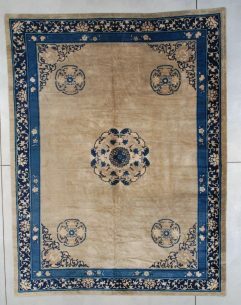 It has a yellow ground with the crosshatch design in a flower motif. The minor border is a modified Greek key and is ivory on a blue ground. This type of border is always depicted vertically. This slanted version is to my knowledge the only known example of this border. The inner border is a modified to pearl motif and as represented here depicts two rows of half pearls with flames. This also to my knowledge is the only known example of this type of border. The outer border is a variation and of the field enclosed in a diamond. This also to my knowledge is the only known example of this type of border. 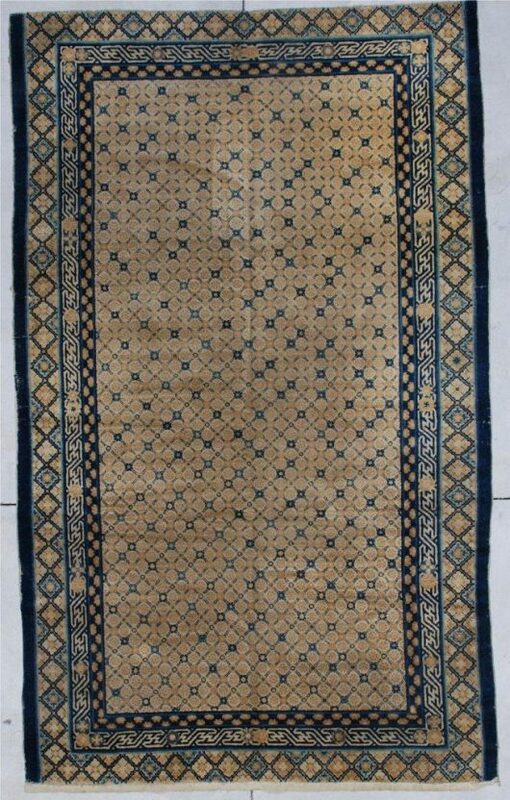 I have every reason to believe that this rug is unique in published examples. Amazingly the rug is essentially full pile. 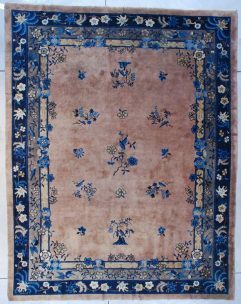 It is wool warped which is extremely rare for a Chinese rug and denotes great age. The warps are two ply and Z spun. The rug is missing the blue apron at either end. The rug has probably spent 90% of its life in storage. 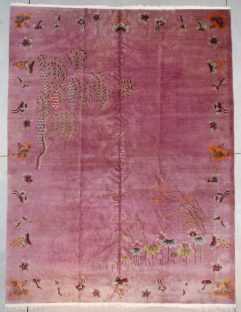 This is a once in a life time opportunity to buy a Chinese rug of this age and condition. The buyer pays the shipping of $95.